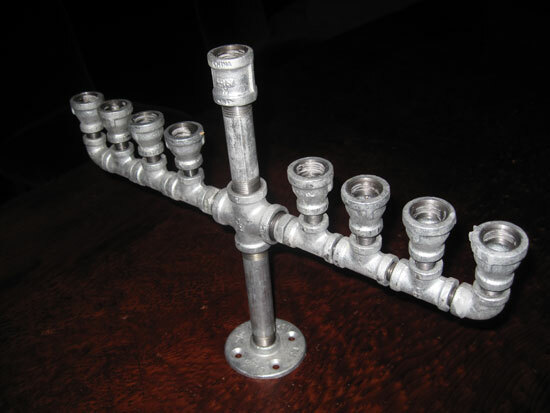 I don’t know where this fantastic metal pipe menorah came from but it was sitting in the middle of my friend Judy Freed’s Hanukah table and begged to be commemorated on the shelves here at The Allee Willis Museum Of Kitsch. Had I seriously taken note of it earlier I would have photographed it with candles ablaze but I got to Judy’s late and was completely distracted by the plethora of Jewish delights that are reliably laid out at her holiday spreads. 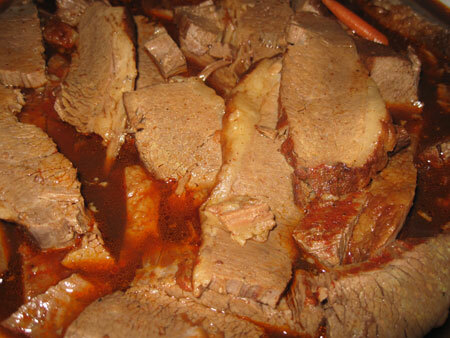 Without question, she makes the best brisket I’ve ever tasted. 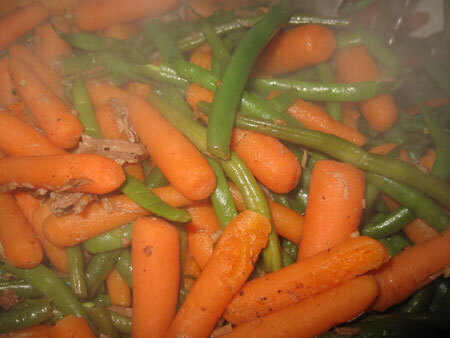 It’s so tender it cuts itself if it even senses utensils coming near. 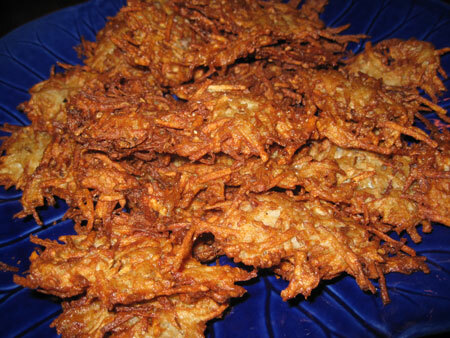 The potato latkes were the perfect blend of crisp outside and mushy inside. 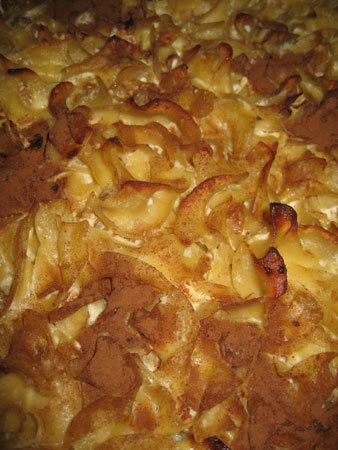 The noodle kugel also had the crisp/mushy thang goin’ on. 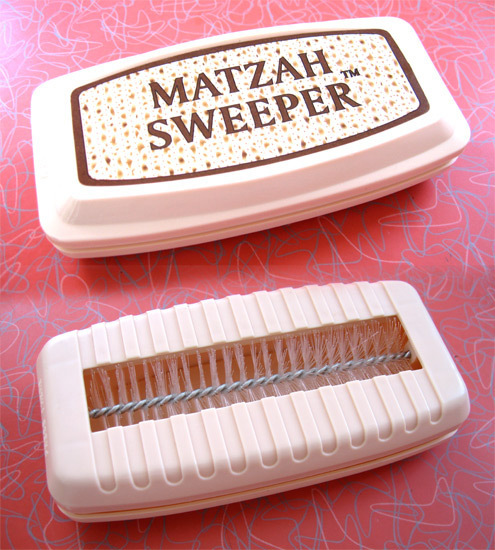 I’ve been going to Judy’s for the Jewish holidays since the early 1980′s. 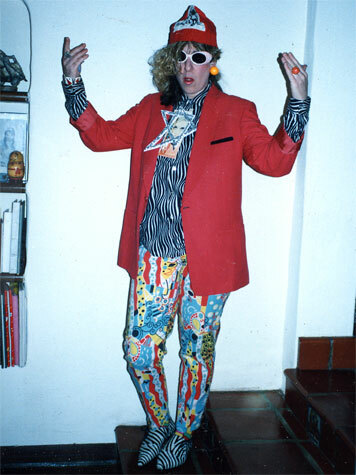 I used to dress for the occasion. I know it’s hard to see details in the photo but I’m wearing a 1950′s souvenir hat from Israel, a massive glitter Jewish star necklace and jewelry all made in Israel. The rest of my clothes didn’t have much to do with Judaism but they haven’t fit me in a couple decades so there’s nothing lost in terms of me clothing myself appropriately to go to Judy’s these days. For dessert, Judy also made chocolate chip cookies the size of tires. 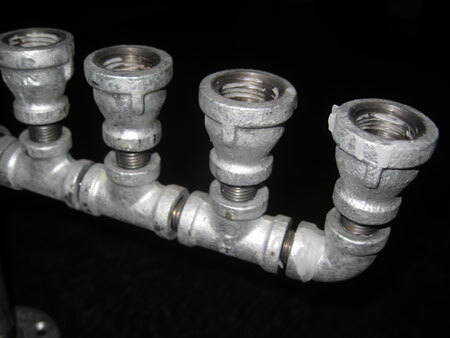 But they were brought out at the moment I noticed the lead pipe menorah so I thankfully forgot to chow down a set of four because I was too busy fumbling for my camera. 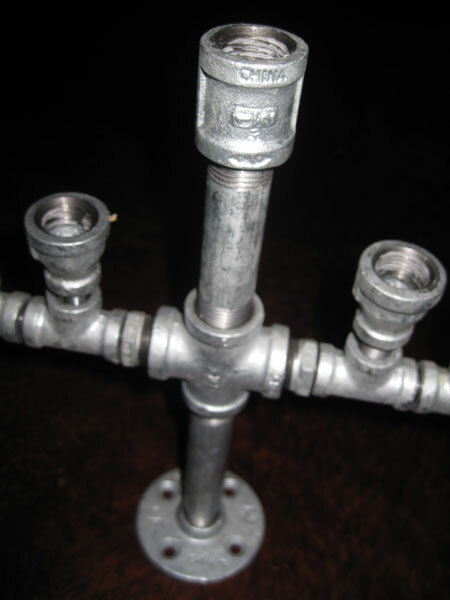 The menorah is unbelievably heavy. 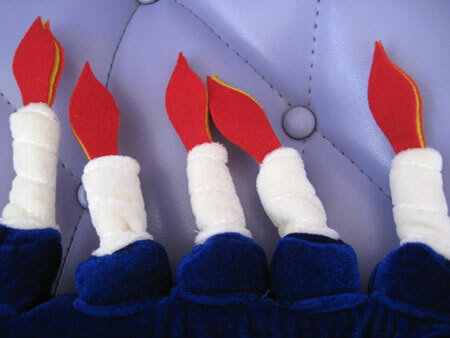 But then again, so is the reason we celebrate Hanukkah. 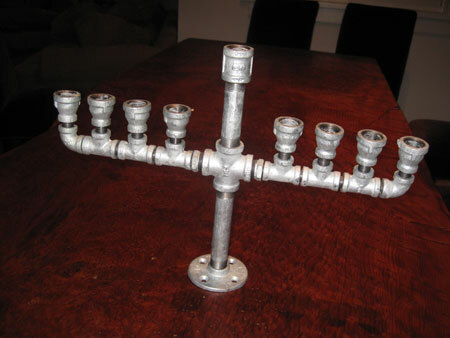 So Happy Day 6 of Hanukah and may you steer clear of holiday cooks whose food tastes more like lead pipes than brisket, kugel and all the other festive food that lights up a holiday table. 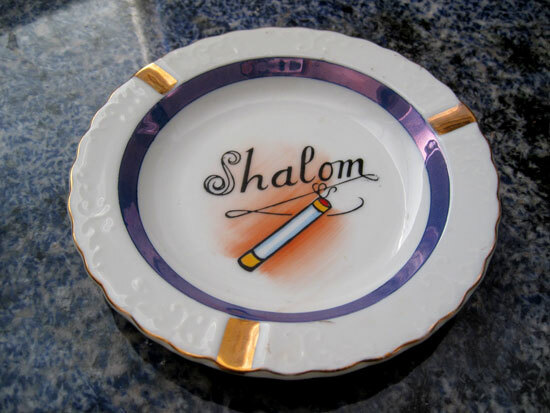 All pretty self-explanatory here – Shalom, hope you’re enjoying this stretch of Hanukah, sit back and have a nice smoke with your Mogen David, wash it down with a matzoh ball and open another present. I used to hate these theme hats as they always look so dorky. But now that I have a blog and a museum that spotlight kitsch this sort of haberdashery seems to fit right in, especially when it’s on my head. 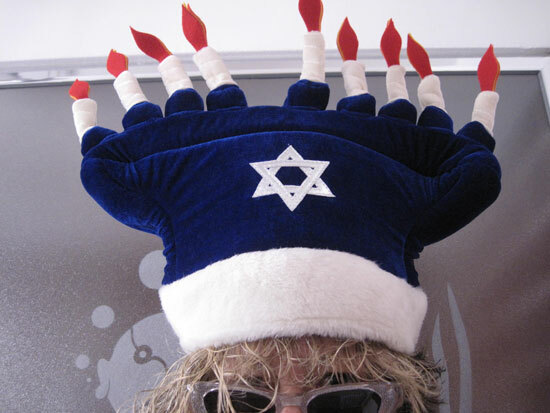 And especially when it’s this awkward menorah hat on this first day of Hanukah. The candles don’t stand up straight and nine candles is kind of too wide for a hat anyway. One of the most festive nights of the Jewish year is the ‘breaking of the fast’ meal after Yom Kipper, a veritable smorgasbord of chopped liver, corned beef, brisket, potato latkes, noodle kugel and whatever else there’s room for on the table. Trust me, after not eating for 24 hours the Chosen People are hungry! 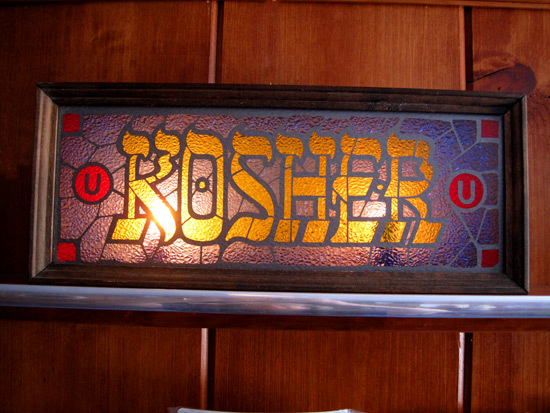 Although this “kosher” sign hangs happily at Willis Wonderland, mine is not the house that one wants to eat at on a night such as this. As such, I’m very lucky that I have a Break-The-Fast itinerary that I stick to like schmaltz (chicken fat) every year and head over to four hamish (friendly, folksy) friends whose houses are are stuffed with machers (big shots) and even some meshugehs (crazy, nuts people) to schmoose with (talk socially, network) while we nosh (eat) like chazzers (pigs). 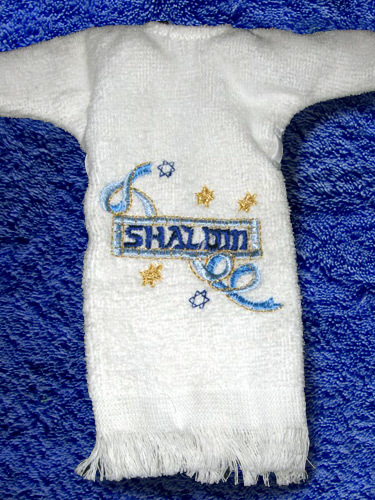 Not only is Barbie always stylish she’s apparently Jewish or at least celebrating the Chosen People this Hanukkah season in her custom sewn Shalom bathrobe. 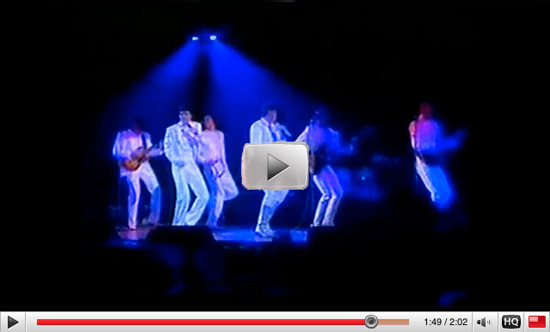 I especially love that it looks like it’s made out of a hand towel. This fashionble bit of Kitsch is the winner of the prestigious Classique d’ Camembert award, the highest honor bestowed upon an object submitted to The Allee Willis Museum of Kitsch at awmok.com. 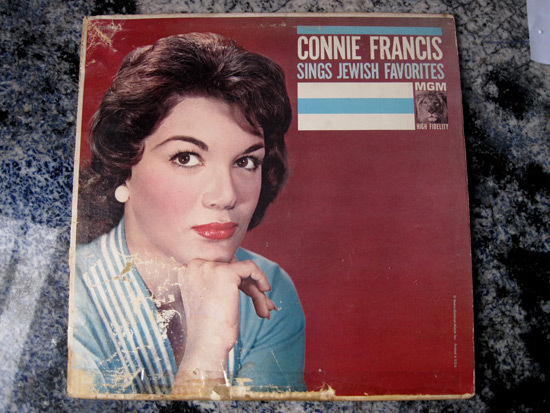 I thank aKitschionado kookykitsch for her excellent and discerning taste. 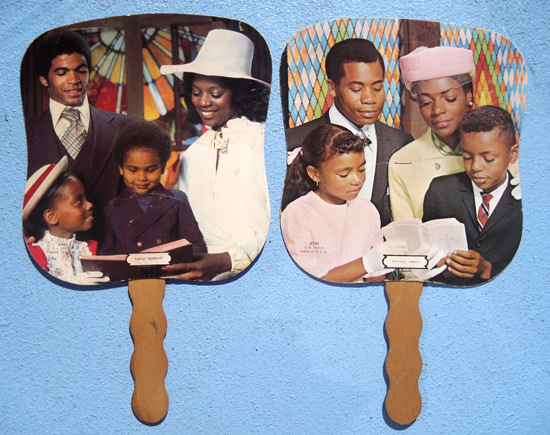 Vintage 1970′s cardboard Mahalia Jackson church fan, courtesy of the Robert L. Parks Funeral Home of Cedartown, Georgia. 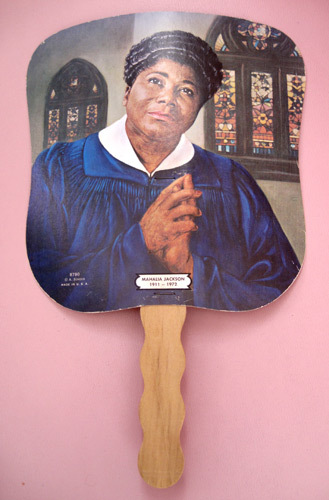 When Jackson, the original Queen of Gospel, passed away in 1972 this fan with her likeness, made by the A. Sheer Company, flooded Black churches in America to join the rest of the church fan flock of Martin Luther Kings, sentimental portraits of African-American families and pastoral scenes courtesy of mostly funeral homes, cleaners and and car dealerships.